A new computed tomography system, the Aquilion Start CT from Canon Medical Systems, made its debut at Arab Health in January, held in Dubai, United Arab Emirates. 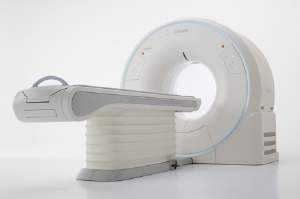 The Aquilion Start has the smallest installation footprint in its class of CT scanners., and provides an affordable total cost-of-ownership and economic operating costs, according to the company. The Aquilion Start’s design incorporates a spacious gantry to allow for comfortable scanning of large and/or obese patients. Intuitive controls and increased automation are designed to help clinical staff quickly familiarize themselves with system operation and advanced technologies inherited from premium CT systems, optimize patient safety, accelerate clinical decision-making and prioritize workflow efficiency. AIDR 3D (Adaptive Iterative Dose Reduction 3D) Enhanced to improve patient safety with up to 75% reduction in radiation dose. Canon’s Aquilion Start CT system launched at Arab Health 2019. Appl Radiol.